Cable for the DMS-59 Connector to DUAL DVI. Used on High End Workstations. Dual DVI to LFH59 Connector. The LFH-59 Connector is 4 Rows of 15 Pins. Connect your nVIDIA® or PNY®, Quadro®, multiple display graphics cards with our LFH-59 cables with gold-plated contacts that provide full conductivity with no data loss. Many high-end work stations utilize multiple display graphics cards that only have a single LFH-59 (also known as DMS-59) connection. 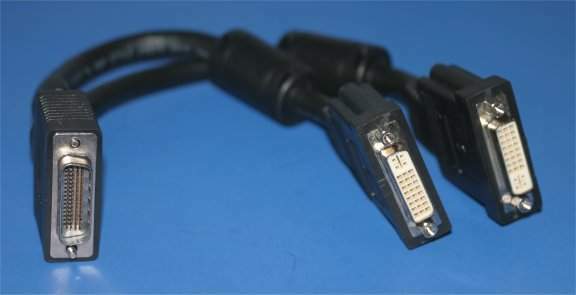 A breakout cable is necessary to convert this single connection into two more common monitor interfaces such as DVI™ or VGA.